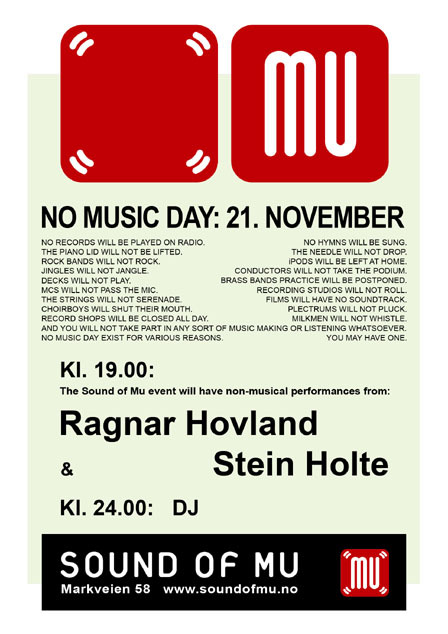 Yes, No Music Day came around on 21 November (this past weekend) and we put on an event to honour it. The brainchild of KLF/K-Foundation musician/artist Bill Drummond, ours was one of a number of No Music events worldwide, as listed on the17.org and penkilnburn.com, the main event being in Brazil this year. 'No Music Day is on 21 November because 22 November is St Cecilia's Day. St Cecilia is the patron saint of music. In many countries 22 November was the day chosen to give thanks for and to celebrate the existence of music' - nomusicday.com. Therefore, we banned music from our music venue for 24 hours, and didn't listen to any music at all until midnight of the 22nd, when our designated DJ put on some 50s Trinidadian calypso (for the record, "Fed-a-ray" by Lord Beginner, if you ever want to try it). But until then, we made the best of the lack of tunes. We put on performances by an author, Ragnar Hovland, and our resident poet Stein Holte, and people simply conversed to no soundtrack. I put a notice on the wall asking people not to touch the triangles dangling there, and no-one actually gave in to temptation. Why have No Music Day? Well, we were on the radio on Friday morning and I made the point that there's a big difference between buying an album to listening to, and being bombarded with 80s hits as you walk down the street to buy a loaf of bread. Music seems to be everywhere and in everything these days, and it's worth it just to shut it off once a year to actually stop and think about it. Drummond conceived of No Music Day as a 5-year plan and this is year four, so 22 November 2009 will be the last No Music Day ('officially'). Get yourselves ready for that one - we should try to make it bigger next time, with your help!